The dream of a summer wedding wrapped in the beauty of the scenic river bank, surrounded by rolling hills, lush fields and those you love. Everything is perfect; the perfect dress, flowers, music, venue, every single detail. Well… almost every detail. This one detail is often forgotten when planning the beautiful summer wedding; your guests comfort. 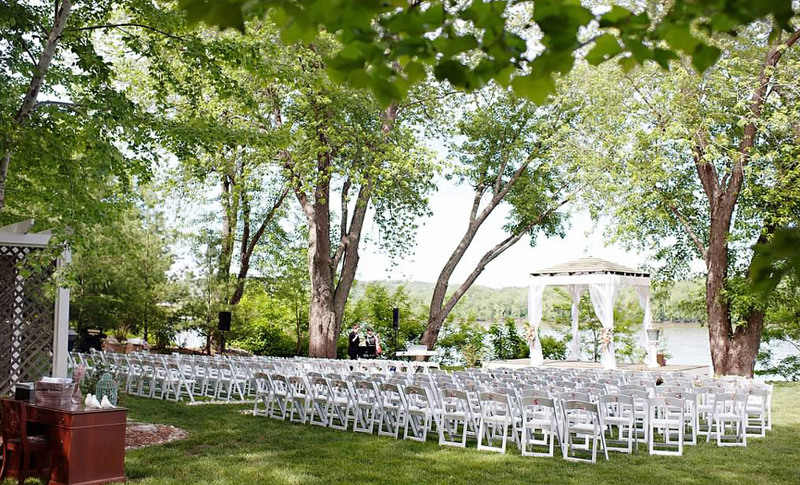 The beauty of the outdoor wedding will certainly bring memories to last you a lifetime, but we want your guests to create beautiful memories as well. In the Northern Kentucky area, our summer days can tend to heat up and bring along some humidity with it. Rest assured we have you covered on the essentials you will need to make sure your guests are refreshed and smiling throughout the entire event. Here are a few things that we help our Summer Brides and Grooms keep in mind for their guests here at The Inn at Oneonta. Make sure that ice-cold water is readily available for your guests to enjoy. Even on the hottest of days a refreshing water will cool you down quickly and keep you hydrated and enjoying the event well into the evening. Start the event off right with some passed drinks for your guests to enjoy. Upon arrival have your guest greeted with an offering of a nice glass of champagne or refreshing Sangria. This is sure to set the tone for a great time to come. The summer evening air in Northern Kentucky is amazing and can certainly bring out the best in all of us. It can however bring out a few others as well, and you certainly want your guests “Smitten not Bitten”. Set up a station where bug spray is available for the guests use. Quick easy and offers a solution to something many will not think to consider. A little breeze goes a long way on a summer day. Being able to provide your guests with paper fans will certainly show you thought of every detail in considering their comfort. A simple way to bring a smile to your guests. If you love the outdoors, you are sure to know the feeling of sitting under the big shade tree on a nice summer day. When selecting your wedding venue, you can easily bring that same refreshing feeling into your event by simply ensuring that your venue has ample natural covering that will provide all the shade your guests will need to enjoy their evening celebrating you. Take the menu to the lighter side of things. What’s more refreshing on a summer day than some fresh strawberries, luscious melons, and a selection of garden fresh veggies. Offering a refreshing menu selection that provides all the flavors of summer is sure to be a hit. The wedding is over and its time for the party to begin. Keeping the air flowing through the venue is key to keeping guests comfortable and enjoying the party well into the evening. Be sure to ask your venue coordinator if fans are available for use during the event. Again your guests will thank you. We hope that you find these tips helpful as you begin to pull the wedding details together. Here at The Inn at Oneonta, attention to detail is what we do. When considering your Northern Kentucky wedding venue, be sure to consider The Inn at Oneonta. Give us a call today to schedule your tour. Happy Planning!